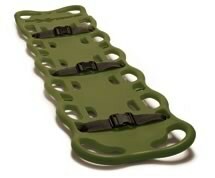 As a rescuer you want your spineboard to be comfortable for your patient, rigid and lightweight. Further you also want to store the board easily. The BaXstrap Spineboard provides this and is one of the lightest boards on the market. The contoured design allows the board to nest compactly. This unique feature also offers patients more comfort, making it less likely that they would move around and aggravate their injuries.